You must make reservations at least 5 minutes in advance of the time at Sunday Brunch - Fairmont Hotel Macdonald. The Empire Ballroom, a designated municipal heritage site, surrounds you with 100 years of history. The spectacular Edmonton Sunday Brunch buffet allows you to treat the whole family to some well deserved time together. 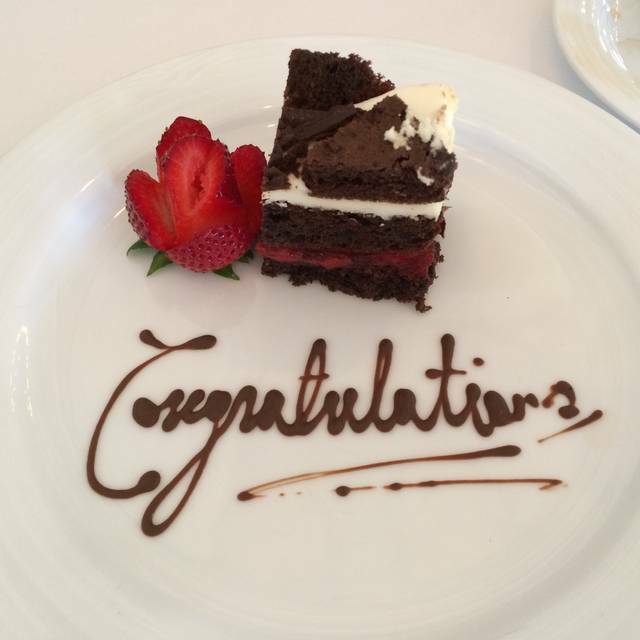 Let Fairmont Hotel Macdonald pamper you with a brunch fit for a king! Offering the most grand selection in downtown Edmonton, this extensive menu offering has something for everyone! Brunch begins with deluxe breakfast entrées and pastries, followed by a wonderful selection of classic and Canadian luncheon cuisine. To further your experience, we have specialty crepe, omelette, and carving stations. A seasonal patio with a magnificent view of the North Saskatchewan River Valley completes your Sunday Brunch dining experience. It was a great brunch. Food was amazing in the beautiful ballroom. A 21st birthday treat. We had terrible service .The waitress took over 30 min to get our bill ,when I asked another server if he could help us he said find ur waitress. When she finally arrived she put the bills and the debit machine on the table and left . I cashed the bills of everyone at the table . There was an automatic 18% gratuity added to the bill which I was very unhappy with because of the terrible service! The service amazing, we had lost a ring while at brunch and the servers/manager went above and beyond to help us! A wonderful experience! I always love going to the Hotel Macdonald - Sunday Brunch in the Empire Ballroom! The food is amazing and I loved our waiter Sunday March 31st. Hassom! He was awesome! It's a great place to go for special occasions! Check it out! Food was very good. Loved the eggs Benedict. The noise level though did not allow for the opportunity to enjoy in conversation with my partner. Children were running aroundwith balloons, yelling and screaming. The servers did their best to make our meal enjoyable, but I don't think they enjoyed the commotion caused by those children either. Wasn’t up to par from last I remembered, in terms of food choice and quality. Overall substandard experience. Expensive but expansive buffet -- so many incredible choices you can't possibly try them all! 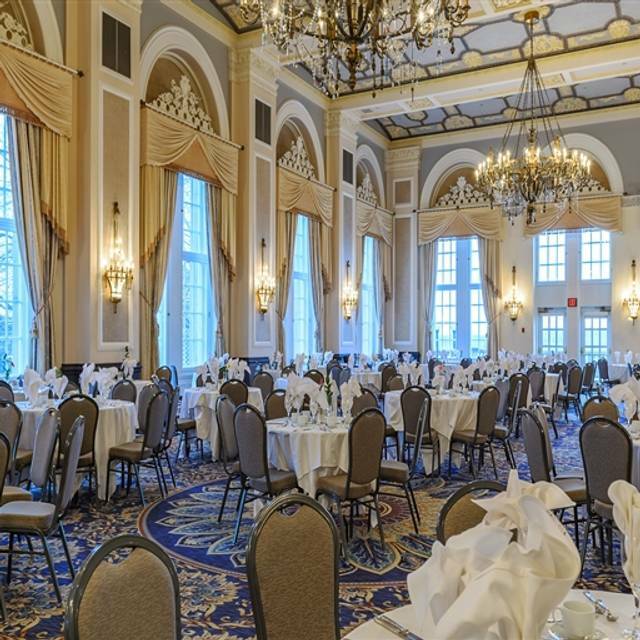 Everything we tried was exquisite, from the omellette and custom-made crepe bar to the whole section of seafood to the heavenly desserts.The setting, in the ballroom of the grand old Hotel Macdonald, is elegant but comfortable. A wonderful choice for a special occasion Sunday! A wonderful venue with an excellent selection of breakfast, lunch, desserts. Something for every appetite. Given the price point, it does encourage over eating, which I am guilty of doing. The MacDonald is a classic hotel. The Ballroom where the brunch is held is best described as stunning. Have been there twice now, including last summer when the patio was open. Servers are attentive and friendly. Expensive, but worth every penny. I would recommend this brunch to any one. It is a bit pricy for my pocket but worth trying once in a while. Excellent food and service at the Sunday Brunch. Ate at many places in Edmonton, but the brunch had the most flavorful food. I'd recommend this for any visit to Edmonton. This was a New Year celebration with family. It was our first time at the Hotel Mac for Brunch and service was superb. Our young toddler was kept happy and there were many dishes to try. There was also a senior discount, which was appreciated. It's not a place to go all the time but very reasonable for the service, food, and ambiance! Thank you! Not a very good Christmas Day Buffet. Mediocre food and poor inattentive service. Almost the same as the regular brunch with nothing to justify the extra cost. Not recommended. Fantastic selection of food and cooked to perfection. I went to this brunch in 2010 and I believe then there was a live pianist which was the biggest draw for me to return. The ambience has changed and it is a lot more crowded, and while the food still made it overall worthwhile i don't think it is the special occasion treat that it was back in 2010 when I first went. We also never got tap water we asked for and no coffee refills unless we kept asking. We have been attending the Fairmont Hotel Christmas Brunch for about 30 years. When it first opened, it was spectacular. One year a brass quartet played Christmas music and for a couple years a pianist played on a grand piano by the double doors at the entry to the ballroom. At one time the entire ballroom was decorated. The tree was in the centre of the ballroom and at other times the crepe and omelette centres were in the ballroom too. It is nice, however, to have the food in the entry to the ballroom. We are disappointed that some of the luxury of the brunch has gone by the wayside and hope that it does not lose anymore of the ambiance. We still enjoyed it immensely and will return again next year. Always love my time at Hotel Mac, especially at Christmas. Only complaint for the food, it needs to be swapped out and freshened up a bit more often as my pasta was cold and hard :S I went back a couple times, with no luck on a fresh batch. Other than that- great service and food! Went for my birthday. Atmosphere was good and relaxed. I was so looking forward to the sweet collection but was bitterly disappointed, they looked nice but tasted bland. Overall, it was good, would probably not go again. It was good for the experience, but if you are going solely for the food, go somewhere else. Really excellent brunch and amazing staff, my only complaint is the room was far too warm. Food selection was fantastic, wish I could have stayed longer!! One concern is that the Sunday brunch bill was somewhat confusing. Perhaps the price changed from when I booked? I assumed gratuity was included but that was not obvious and there was an extra line for gratuity - so we are still not sure if our server received 12% or 30%. If I come again, I will pay more attention and be clear ahead of time. Another concern was that the front desk could not provide helpful information re parking options with all the Grey Cup closures when I phoned Sat evening. Also part of our party arrived early and were seated which was nice for them. However, we arrived on time so our meeting time with them was shortened. Had we known, we too could have arrived early. Overall, more than two hours for a sitting would be preferable. Was not our first time to the Sunday Brunch. We feel its a nice treat to go and dress up and go to a nice brunch in a great atmosphere. But since the last time we went we feel the food was not as good and not as flavorful. Omelette station is always good. Service at our table was sub par our sever was not very attentive, even to get a drink refill. Still a very nice treat to go but felt the food is not as good as it has been in the past. I booked for 3 seats to appreciate clients business. I was disappointed that the night before was an event and the decorations and special design form somebody were still there. This hotel is famous for its traditional and historical architecture and ambiance. We were in a room with neon party lights without any outdoor window. The selection of food was limited as well. I had better experiencese in the past. The food was fine and the location was nice. But the major draw used to be bottomless mimosas, and now they charge $3/piece. 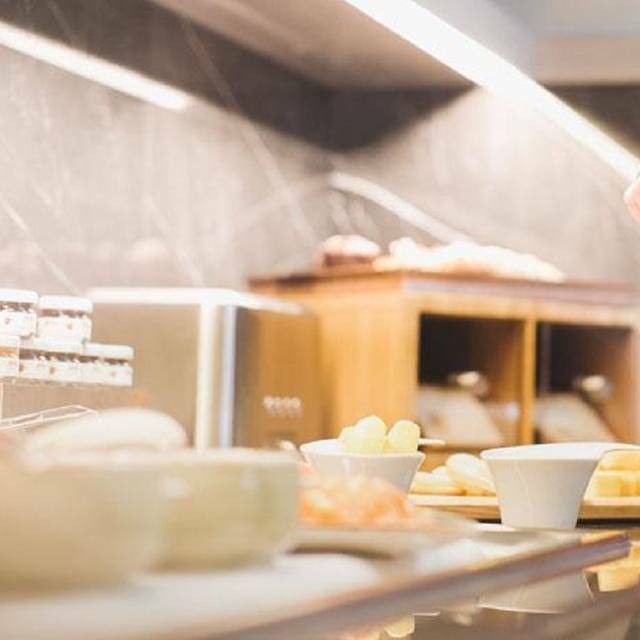 With bottomless drinks the $60 price tag may be reasonable, but now that the mimosas aren’t included, there are plenty of places that have food just as good for far cheaper. I was told over the phone that there would be a wide range of vegetarian options. But I didn’t find it correct. But thanks to Chef Vinayak, he came and Offered to prepare some Indian food especially for us. Honestly speaking that was beyond my unexpection. Appreciate all his efforts. The detail in the food is spectacular! The choices of dishes are immense! Something for all tastes! We go on special occasions a couple times a year and totally enjoy the ambiance, the high end professional staff and the incredible experience. A bit pricey but worth it. The ambiance is great and selection is wonderful. 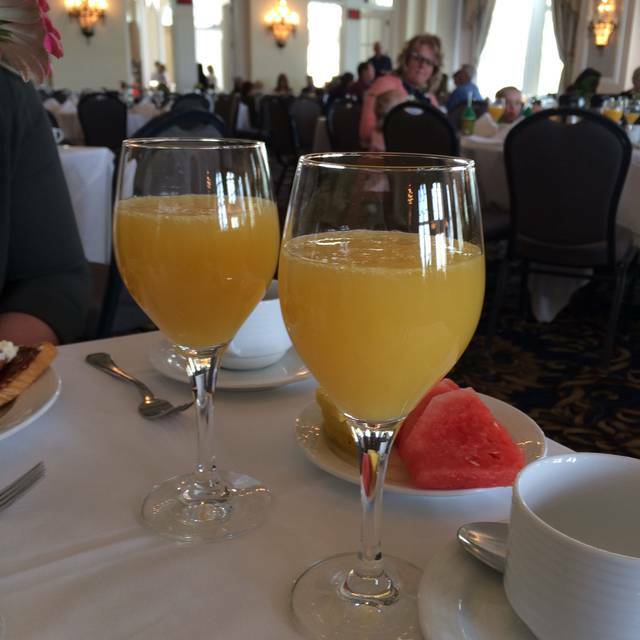 We have been going to the Fairmont Macdonald for several years and always enjoyed the quality and selection of the food for the Sunday brunches. We have been going on special occasions like Thanksgiving/ Easter and Christmas day and have always enjoyed the experience with the only down side being the cost per person. For the past 5 years, we have been going to Hotel Macdonald for our Thanksgiving celebration. This place is elegant and beautiful. The food, for the most part, is delicious. There is a lot to chose from, very accommodating to anyone dietary requirements. Highly recommend this place. Have been celebrating special occasions at the Mac since my wedding in 2000. Hope to continue for many years! Over the years we have been to the brunch on many occasions - on this occasion we were sorely disappointed - the service staff essentially ignored our existence - the food selections were significantly diminished over previous visits, and the quality commonplace and uninspiring. One of our party shared our concerns to the hostess, and later a manager came out to review with us. We were given a 30% discount on our bill. Unfortunately it is clear that your brunch is not surviving the challenges of the times and you are cost cutting with all the things that inspired patrons to seek out your hotel for their special occasions.